This blog is due to celebrate its sixth anniversary in about a week (which will gets its own post, per tradition). This means that it’s seen, and written about a lot. When this blog, started, Emerson Power Transmission was still in business in Ithaca. But, it was already on its way out; in April 2007, the headquarters shifted from Ithaca to suburban Cincinnati, taking about 55 jobs with it. At the time, about 400 people were still employed at their South Hill facility. That wasn’t to last long. I dunno, maybe it was bound to happen – Emerson ended up bleeding 25,000 jobs worldwide during the recession, nearly 20% of its workforce. But for the 228 employees who were at the Ithaca facility in August 2009, it was no less unpleasant when the closure was announced. The last folks closed up shop in 2011, but the facility’s polluted legacy lives on. It was about 16 months ago when it was announced that the property, which has been for sale for $3.9 million, found a buyer. A lot of things were hush-hush, but it was seen as auspicious. Fast forward a year – we have a name and a firm – David Lubin, the developer of the Harold’s Square mixed-use tower approved for downtown, and his LLC, the amusingly named “UnChained Properties”. A cadre of architecture, planning and environmental firms are also involved. Lubin et al. is currently asking the town to make the 95-acre parcel a PDZ, Planned Development Zone (likewise, they’re requesting the city make their portion its zoning equivalent, PUD, for Planned Urban Development), which is fairly generous in its uses and form (i.e. 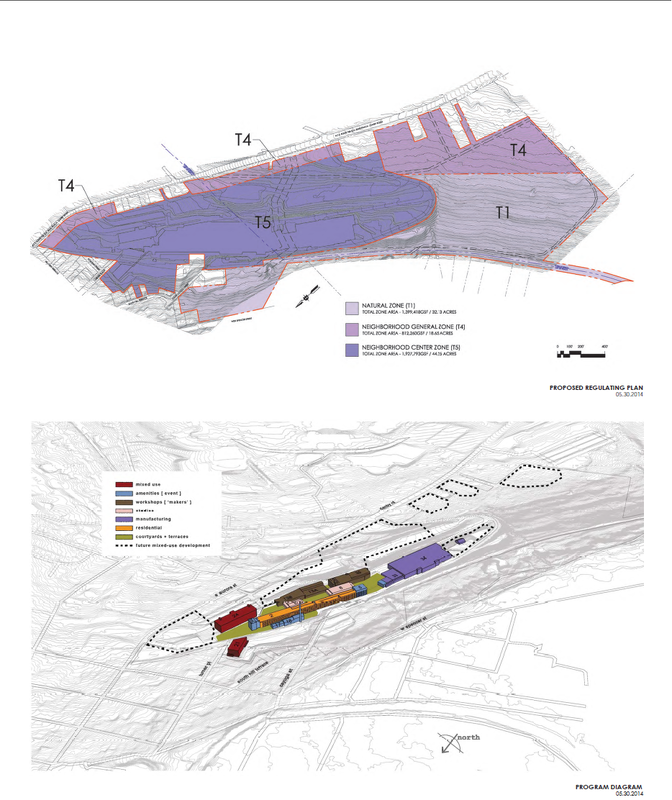 conveneient for mixed-use projects). Both city and town portions are zoned industrial. 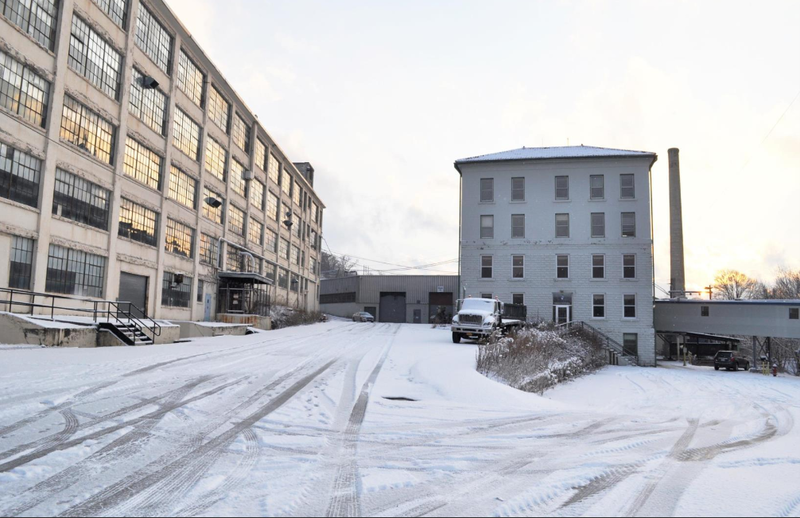 The development firm received money (forfeited by Emerson for failing to meet their IDA tax incentives) to conduct a feasibility study for reanalysis of the site. The redeveloped property would be a mixed-use neighborhood called the “Chain Works District“. A lot of big numbers are being tossed around. 800,000 sq ft of redeveloped space. $100 million invested. 1,000 permanent jobs on site. 10 to 15 years for build-out. By any Ithaca-centric measurement, this is a huge undertaking. UnChained Properties hosted a public meeting in April (attended by Jason at IB), with a second planned during this summer. A copy of the April presentation can be found here. 10 to 15 years seems like a long time. It is. But the current Emerson site is a hodge-podge of decades of random additions. Not all of these additions will be making their way into the final product. Most of the post-war additions will be removed, save for a section on the southwest side that will be reserved as a future manufacturing facility. 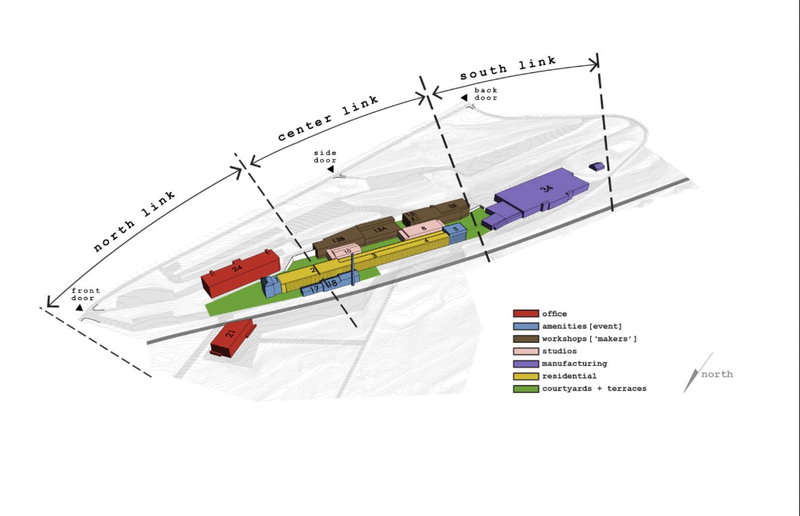 The site calls for office space, artists studios, workshops, a healthy dose of residential loft-style units, and a generous smattering of open-spaces in the form of courtyards and terraces, created by the removal of some of the newer factory additions. The Gateway Trail will run through the site, and it will host some amenities, like event/concert space and a cafe. According to the details submitted to the town, the developer is shooting for LEED certification as the phases are built-out. 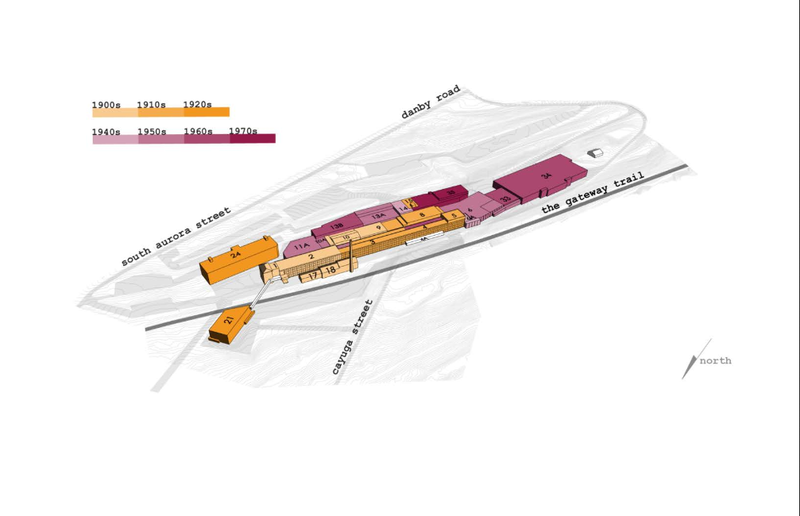 Perhaps just as interesting is that they aren’t solely seeking to build within the perimeter of the old factory spaces. The submission to the town shows multiple sites considered for new construction, with “T4” and “T5” PDZ zoning that would allow for 4-story and 6-story mixed use structures respectively. Does seem all very pie-in-the-sky-ish? Perhaps. It’s a lot of big dreams and it’s going to take a lot of time, money and manpower to make it come to fruition. But I’ll be interested in watching it all evolve as it slowly moves towards reality.